Whether it’s a special kids gift for the holidays, a child’s birthday present, or another family occasion (spring holidays, the start of summer, a new year, or the school year), Kidstir is a gift the whole family will cherish and remember! Our mission is to help parents raise curious, confident, capable kids. We believe in getting kids in the mix—after all, the more opportunities they have to try new things and build new life skills, the happier and more confident they’ll grow up to be. But we’re also parents who 100-percent understand that it can feel near impossible to create those moments as often as we’d like. It’s easy to keep putting them off—until they never happen at all. Consider each monthly delivery time in a box: a simple reminder to put the rest of life aside for a little while so you can cook, play, and learn with the little people you love most. 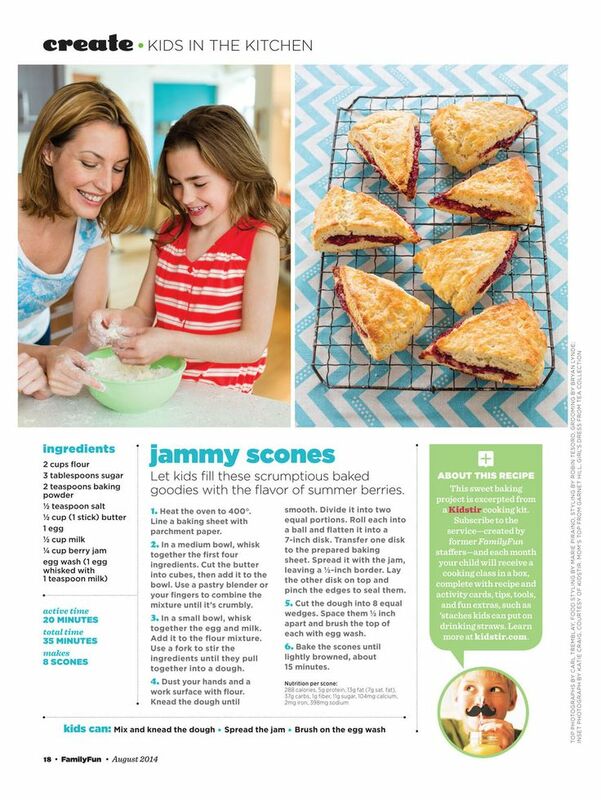 Kidstir has been lauded by Food Network, Parents, FamilyFun, All Recipes, Better Homes & Gardens, Inc, NY Times, LA Times, Chicago Tribune, Dallas Morning News, Sirius XM, CoolMomPicks, SheKnows, BabyCenter, BeliefNet, Grandparents.com, Dr. Toy, AblePlay.org, Special Needs Magazine and more! Our Happy Cooking Kits are designed to spark a love of good food in kids! Each monthly kit provides a hands-on food adventure for children. All of our kits are themed around seasonal ingredients and occasions and have been tested with real families to ensure that everything is fun, learning-filled, easy to use, and absolutely delicious. Kids 5 to 10 and their parents, grandparents, aunts, uncles and other special grown-ups love cooking with Kidstir. We do the planning, so you can have fun in the kitchen! JANUARY Soup’s On! Serve up bowls of hearty homemade soup. FEBRUARY We Heart Dinner Turn an everyday meal into a grand occasion! MARCH Sunny Salads It’s time to toss up some colorful, tasty salads. APRIL Amazing Appetizers Serve up finger foods to family and friends. MAY Hello, Breakfast! Start your day with a farm-to-table breakfast. JUNE Snack Happy When a snack attack hits, grab one made from scratch! JULY Summer Sips Quench your thirst with some cool-off drinks. AUGUST Sandwich Shop Get ready to make and pack a yummy lunch. SEPTEMBER Bake Me Happy It’s time to start baking your very own goodies! OCTOBER Spooky Celebration Cook up some creepy cuisine for Halloween. NOVEMBER Gobbling Good Fixings This Thanksgiving, head to the kitchen and get cooking. DECEMBER Winter Wonderland Cookies Let it snow in your kitchen with a flurry of treats. SPECIAL EDITION KITS—No Subscription Required! Taco Truck Fun Learn how to cook Mexican food at home. Bake My Day Turn your kitchen into an at-home bakery. Good Morning Wake up to a hearty homemade breakfast. Growing up is just about the biggest adventure there ever was—and it’s full of twists and turns. Our Growing Up Guides provide a little GPS. Each monthly guide invites kids 5 to 10 to explore a new destination on the road to becoming a big kid. By sharing cool facts and fun, hands-on activities, the guides provide kids with an engaging and entertaining way to practice valuable life skills. Even better, they promise to spark new family conversations and closer connections. and build their very own Guidebook to Growing Up! MAY Tech City Get the best out of screens. SPECIAL EDITION GUIDES—No Subscription Required! Uncharted Territory Travel someplace new (without getting lost). Launching Pad Think creatively and solve problems like an entrepreneur. Voyage of the Leader Ship Make a difference in your community. 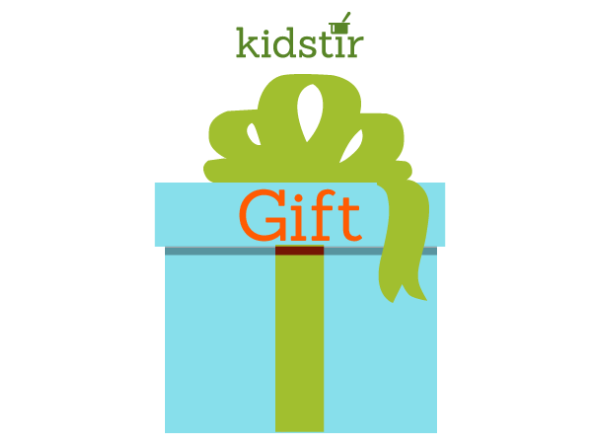 There are lots of ways to gift Kidstir. Let’s start off with the very best. 50% off your first Kidstir box! Take $7 off all new subscriptions, with discounts up to 50% off your first box! Pay under $6 for the first box of your prepaid 12 month subscription! Use code JOLLY50 at checkout to get this amazing discount! Buy now before our award-winning Happy Cooking Winter Wonderland kits are gone! If you loved our cooking kits last year, get started with your Growing Up Guides subscription for the year ahead! Discount cannot be combined with any other offers and/or applied retroactively to previously placed orders. Offer ends 12.31.18. (One time purchase, no auto-renewal) allow your little chef to build their very own cookbook while receiving Kidstir kits for a full year. Prepaid 12 Month subscriptions cost $12.95 per kit and include a Bonus Kidstir Cookbook Binder or Bonus Guidebook to Growing Up Binder ($19.95 value)! Your child will receive one box per month for the duration of his or her prepaid 12 month subscription. 12 month prepaid subscriptions are not refundable or cancellable for any reason. Subscriptions automatically end after 12 months when your little chef’s cookbook collection is complete. (Auto-renewing subscriptions) allow your kids to start cooking, playing, and learning with Kidstir while you only pay for 1, 3, or 6 months at a time. Kits cost $14.50-$15.95 per box depending on the subscription term you choose. Your child will receive one box per month for the duration of your subscription. The subscription will auto-renew for the length of your initial term to ensure that your child will continue to get boxes until they have collected all 12 boxes over the course of a year. Shipments and charges automatically end after 12 months are complete. If you know when you place your order that you do not want to continue past the length of the initial 1, 3 or 6 month term, cancel before the 15th of the final month of the term. If you cancel a prepaid order term, we will ship the 1, 3, or 6 months of boxes you have already paid for. Shipments and charges will stop after the end of the prepaid term. Happy Cooking Taco Truck Fun Kit and Happy Cooking Bake My Day Kit, Happy Cooking Good Morning Kit, Growing Up Uncharted Territory, Growing Up Launch Pad, Growing Up Voyage of the Leader Ship (One time purchase, no auto-renewal, no subscription required!) are a fun way to try out Kidstir without signing up for an auto-renewing subscription. If your child loves his or her Kidstir experience and wants to keep having fun with us, you can sign up for an ongoing subscription. At only $19.95, these kits are also a great gift for a Kidstir fan who already has a Monthly, 3, 6 or 12 month subscription because they are not part of our regular 12 month cycle of kits. Please note that these kits are only available in a standard (not a sibling) configuration. Pick these up in our Store! (One time purchase, no auto-renewal) are for kids who previously started Kidstir subscriptions, but had an issue that prevented them from continuing for the full 12 month cycle. Perhaps the first few months were a gift that was not continued by the original gift giver. Or a child got busy with other activities and the your family needed to take a break. In some cases an auto renewal payment didn’t go through because of an expiration or security issue with a credit card. Thus kits were missed and the child has not finished the entire 12 month program or built an entire Happy Cooking Cookbook or Guidebook to Growing Up. Our Custom Returning Subscriber section allows you to “fill in” those missing boxes for the child. You simply select the boxes that the child doesn’t have and pay for them upfront. Pricing improves depending on the number of kits purchased at one time. 1-5 kits: $15.95/kit, 6-9 kits: $14.50/kit, 10-12 kits: $12.95/kit. There are no cancellations, refunds or auto renewals. We schedule shipment of purchased kits during their standard months, i.e our Happy Cooking Gobbling Good Fixings Kit will ship in November and the Growing Up Energy Bar Guide in January, etc. Your child will be thrilled to complete his or her Happy Cooking Cookbook or Guidebook to Growing Up! (One time purchase, no auto-renewal) extend monthly cooking or learning experiences into a book that will be both a favorite keepsake and a handy reference guide. While you can easily store your Kidstir recipes or activity pages in one of your kit boxes, our custom cookbook and guidebook binders are designed to organize your recipes and activity pages and allow your child to build a special Happy Cooking Cookbook or Guidebook to Growing Up all their own. This 3 ring binder is the perfect size to fit a year full of fun and educational materials. Plus, printed chapter dividers ensure your kids can easily find and cook up their favorite recipes and lessons whenever they want! Binders are durable, wipe clean, and have easy open rings. They also lay flat for convenient use. For easy reference, Kids Kitchen Rules are included inside and Handy Measurements are printed right on the back of the Happy Cooking Cookbook. The Growing Up Guidebook includes a beautiful fold out Adventure Map to navigate the twists and turns on the road to growing up! Join or gift a prepaid 12 month Kidstir subscription and receive your free cookbook or guidebook binder automatically alongside your first shipment. You do not need to make a separate purchase. While purchasing a Monthly, 3, or 6 month subscription, you will see the option to add-on a Happy Cooking Cookbook Binder or Guidebook to Growing Up Binder for $19.95 extra. If you choose to purchase at a later time, you can find Binders in our Store. Happy cooking! All your questions, answered! Still got questions? We’ve answered your most common gift inquiries here. Happy gift giving!